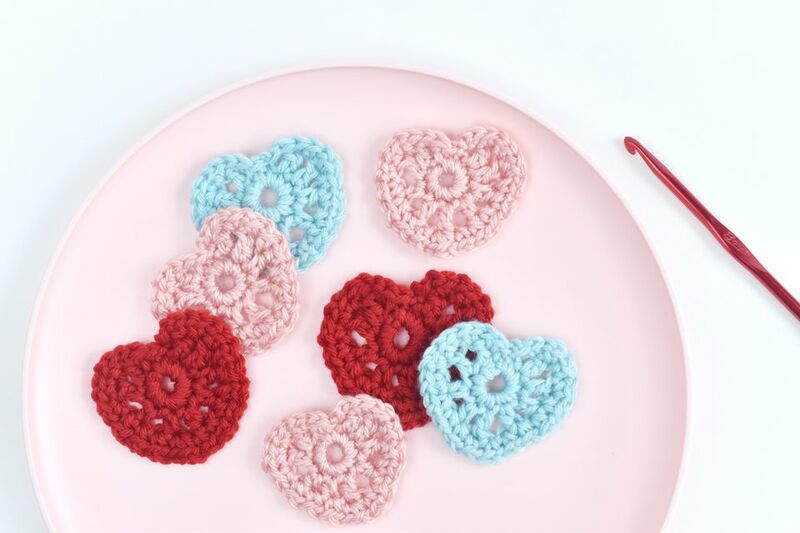 Whether you want to crochet something for Valentine's Day or you simply want to show your love of crochet, these easy hearts are quick and fun to make! In fact, once you get the hang of it, you can make each one in about 15 minutes. You can use these in so many ways, so grab some pretty yarn and start crocheting a bit of love! Start by making the base ring that the crochet gets built on. Make a slip knot and then ch 4 and join with sl st to form a ring. Turn your work so that the slip knot is at the back of your work. ch 1 for a turning chain and then sc into the center of the ring 10 times. Join with sl st into the slip stitch from when you formed the ring. Typically you would join to the turning chain, but by changing the placement of the join, it helps shape the heart indent. You should have 11 stitches around the circle. Skip the turning chain and make your first double crochet into the first single crochet from round one. [dc, ch 1] 2 times. [hdc, ch 1] 2 times. [hdc, ch 1] 2 times. [dc, ch 1] 2 times. sl st in the last two stitches. You should have 19 stitches around the circle, which now looks more like a heart. ch 1 for a turning chain. [sc, ch 1] 8 times. Work the single crochets into the stitches instead of the gaps from the chain stitches on round two. sc 2 into the chain before the dc. ch1. [sc, ch 1] 9 times. sl st in the last stitch. Cut the yarn, leaving about six inches. Secure the last stitch and weave in the ends with a yarn or tapestry needle. As you secure the yarn at the heart indent, weave the needle towards the indent, which helps complete the heart shape. Make a heart garland by attaching the hearts together on a string of chain stitch. As you make the chain, pass your hook through the back of a heart to connect it, then add more chain and more hearts. Craft heart pins for friends and family. Simply stitch a pin back to the back of the heart. You may want to add a felt backing first. Create crocheted heart cookies for make-believe play. Make one heart with tan yarn on a larger hook (or add an extra round of single crochet) to make it a little bigger. Then make a second heart for the frosting. Stitch them together with colorful yarn "sprinkles!" Stack a bunch of bigger crochet hearts together and tie the pile with a ribbon. You've now got the perfect gift of coasters or washcloths!